Mahalaya is the time to invoke the Goddess and send an invitation to pay a visit to her paternal home on the Earth. And every year to welcome her what we don’t do – Theme pandals to freakish lighting, cooking delish foods to becoming a fashion-ninja, we do all! If the world around goes innovative to welcome the Goddess in their own “ishtyle” why not we? After all, it is Innofied, where we get ‘Innovations Simplified’. We not only think, eat, and sleep ‘app development’, we make every moment special, out-of-the-world, and wacko by being INNOVATIVE! 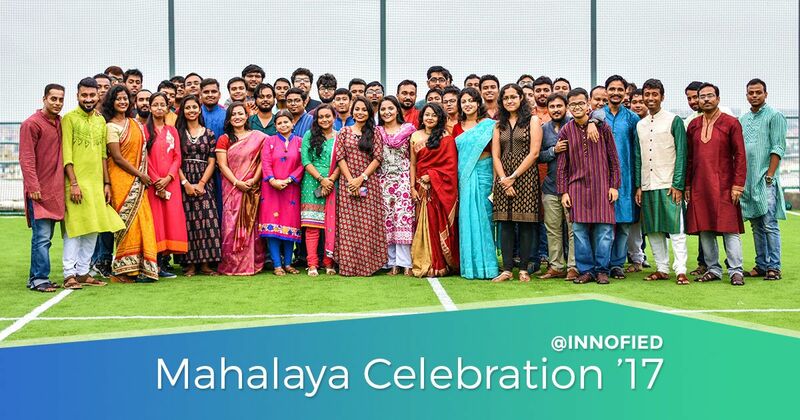 Celebrations do reach a new height, every day at Innofied, whether it’s Christmas or Independence, we know how to broaden the smile on the face of our teammates. So, Mahalaya 2017 was no exception! 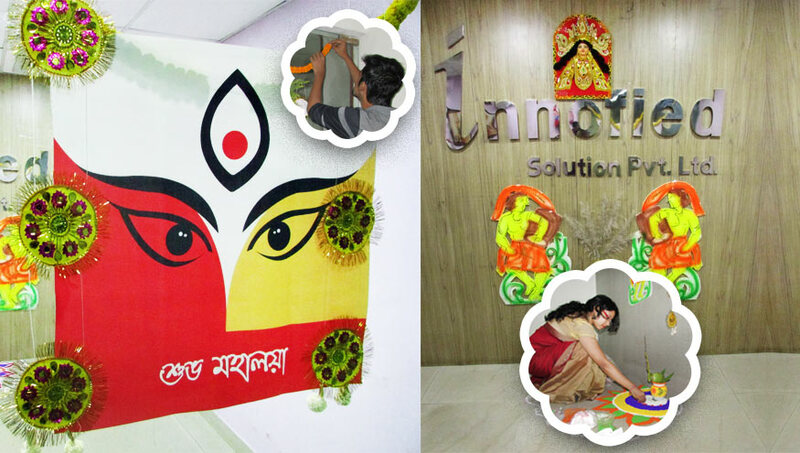 Pre-puja celebrations started at Innofied from 19th September. As the door of the office opened sharp at 9 AM, busy bees were at work and by an hour colorful rangoli, kashful (Kans Grass), decorations with colorful papers, artworks, rice lights, repurposed DIY lanterns, almost every single element that was made by hand, had a creative touch and uniqueness was there to make our worklab look GINGER! We sheerly maintain a unique balance between our productivity and fun. Innofieders make sure that the work graph never globs! 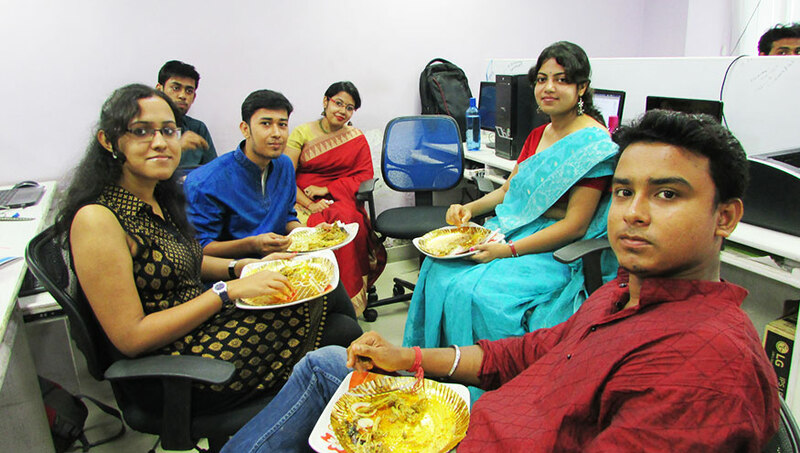 We had deadlines, delivery, estimations, and planning just like a regular day, but those extra time for coffees and gossips was reserved for Mahalaya 2017 celebrations. What’s a Celebration Without Finger-Licking Foods & Snaps! None of the celebrations or gathering at Innofied is complete without good food. And Mahalaya 2017, was going to be bigger than the previous year. So, the food should not be just GOOD, but GREAT! You can look at the satisfying faces – and those colorful plates, which were gastronomes delight! And trust me those lenses can turn anyone pixel-perfect and happy! Now, I can simply brag about our Cultural Team – Yes, we have one of the best Cult Team, who knows how to keep the audience glued to their seats. 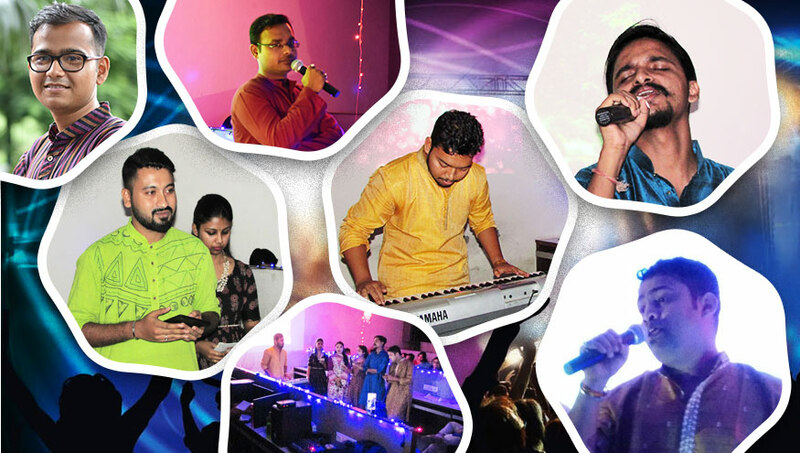 Not just various programmes but every activity had its own identity in Mahalaya 2017. We started with a melodious song by Aritra, (our new singing sensation). He sang a popular composition of Arka Mukherjee from the movie Nirbaak. Next was a recitation by Dipanjan, that marks the theme of the pre-puja celebrations. A poem of Rabindranath Tagore, called “Pujar Saaj” with an undertone that states how poor people fails to make life blissful even in the days of celebrations. Now to uplift the moist atmosphere, next was a romantic solo performance by Manish, who sang the title song of Kal Ho Na Ho. You see, the host of our show never keep us down. He always has his own share of jokes, shayaris, poems, and witty talks to amuse us throughout. The iconic-all-time host of our event Rahul had something good to our ears. A short poem by Arani Basu called “Jaltaranga”. Presenting something unique is always the identity of our events at Innofied, this time we bought a combo of melodious compositions and self-composed poetry from our “Corpo-Gulzar”, Pritam, accompanied by vocal queen, Nidhi. The duet composition was tagged as “Surey Chhonde Agomoni”. The songs and the poetry had set a different trance in the room. It celebrated womanhood and reflection of various faces of women in the society. The showstopper of the day was a chorus performance – a romantic medley of old and new songs. It had Bolly numbers that were sensation then and now. The thread had oldies like “Tu tu hai Wahi”, “Gulabi Aankhen” and new hits like “Kaise Bataye Kyun Tujhko Chahe” and “Tenu Samjhawan Ki”. 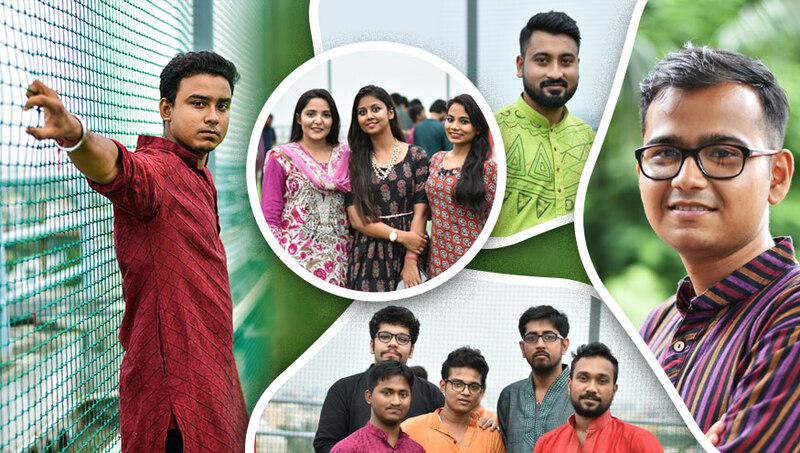 However, to conclude nothing is better than the touch of Rabindrasangeet, the group ended the medley with “Ekla Cholo Re” – Group member consisted of Nidhi, Trisha, Ayesha, Manish, and Aritra and to give the performance a Dolby effect almost all Innofieders were humming the preludes. To our surprise, the chord of the medley didn’t stop. It reached a new pitch as Tamodeep, the man with “magical fingers” gifted us with a self-composition on his synthesizer. And it strikes high – AHA! We hosted our third hackathon back some days and we delayed a little to give away the awards (Since judges had a tough time deciding who’s the best this time!) And Mahalaya 2017 just gave us the reason to celebrate it along. We announced the winner and gave the trophy. No, I am not gonna tell the details right now! 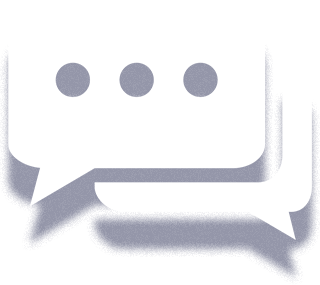 To know the name and the Hackathon stay tuned, as my next blog will be right about it! Till then, tell me how you feel. Did you think we made life feel large every time? Oops forgot to say – Happy Durga Puja 2017! A fun place to work at. Want to know how we have a fun-filled life?